It's mid June and I'm feeling a little forlorn. See, I'm usually sunning, sipping and eating the week away on the breezy North Carolina coast with my family. Instead I'm blogging. In a 99-degree concrete jungle. 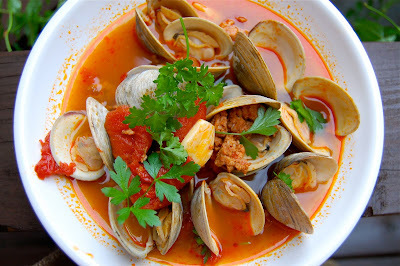 The trip didn't come together this year, but making a big pot of clams and chorizo, one of my favorite, simple seafood dishes, has helped ease my ocean yearning. I love spooning this classic spicy and salty combo out into big bowls with crusty French bread for dipping. You could also serve it over pasta or cous cous. Heat the oil in a large heavy pot with a lid over medium high heat. Add the garlic and chorizo, and cook for a few minutes, breaking up the fresh sausage. Add the wine and tomatoes and bring to a simmer. Add the clams and layer the Swiss chard on top. Cover and cook over medium heat for 10 minutes. Discard any clams that haven’t opened by then. Garnish with parsley. Serving tip: Don’t forget to put out an empty bowl for your guests to dump their clam shells. 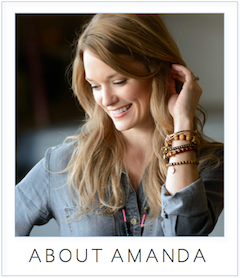 Love this Amanda. This is one of my go-to's, minue the tomats. Thanks, Melissa! So adaptable too. Last time I threw in leeks. I don't eat pork but I want to try this with the soy Chorizo from Trader Joe's... it's just as spicy so hopefully it will work! Nicole - you could also just skip the pork and add some sprinklings of red chile flakes for heat. Let me know if you try it out! Nicole - let me know how the soy chorizo works. I find that it cooks very similarly to regular chorizo and would LOVE this recipe! amanda: will definitely pick you up some chorizo from whitmore - a new farmer with us who makes his own & sells for us in bethesda! How much is 3-4 links? Is that about 3/4-1 cup if you're working with no links? I think one link is about 1/4 lb, so that's almost 1 lb of sausage, probably more like 2 cups. But the beauty is that this recipe doesn't need to be exact. Just think about your sausage-to-clam or sausage-to-bite ratio. 2 cups would be 1/2 cup per serving, which seems right to me. Maddy - I would love it! Thanks for thinking of it. I think I'll make this recipe, but substitute mussels for the clams!!! YUMMMM!! Infamous - I'll have to try that myself!